I made this road trip together with some friends and we stayed the night in Mesa's Holiday Inn Hotel before driving the Apache Trail so we would be fit the next morning. The Mesa Holiday Inn Hotel is also nearby the Phoenix Sky Harbor Airport which can be handy if you're flying in. From Mesa we started our road trip in direction of Apache Junction and started to get in the spooky mood as the Supersticious Mountains came into view. After taking the AZ 88 turn off we headed to Goldfield, which is probably one of the first places on the Apache Trail that deserves a stop. The ghost town of Goldfield unfortunately has lost it scary image and most parts of it are commercialised with little shops and bars. After Goldfield where we took quite some pictures we headed to the Lost Dutchman State Park where we learned some more about the golden era's of the mines in this part of Arizona and of course some real cowboy legends. From the rocky Tonto National Forest area we continued our way to the famous Roosevelt Dam built in the Salt River and the western town of Tortilla Flat. The Theodore Roosevelt Dam is definitely worth a visit. 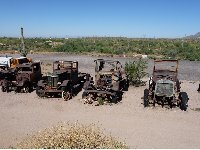 We drove down the Apache Trail to the Theodore Roosevelt Lake, the Tonto National Monument and the mining town of Globe that boomed many years ago for the great find of silver and copper. Besides the rich history of Arizona and this fascinating part of the United States, the landscape is also really nice with enormous mountain cliffs and long stretching valley's. We had a great time, exploring the Wild West of the Apache Trail! 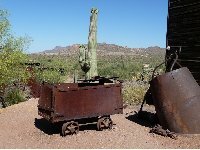 Did you enjoy Apache Trail AZ and have you been on a holiday in Apache Junction, United States? What to do in Apache Junction: Rent a car a drive the Apache Trail AZ. 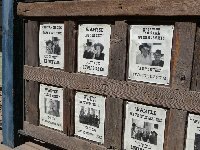 Where to eat in Apache Junction: There are some bars on the way like in Goldfield but do keep in mind to pack food and enough drinking water. Liked: The roadtrip was great, the history of the Apache Trail was also something we didn't know much about. Disliked: The part of Goldfield that was too commercialised.